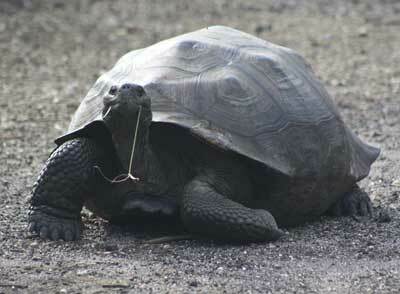 comprises a full 60% of the total land mass in the Galapagos National Park and Reserve. 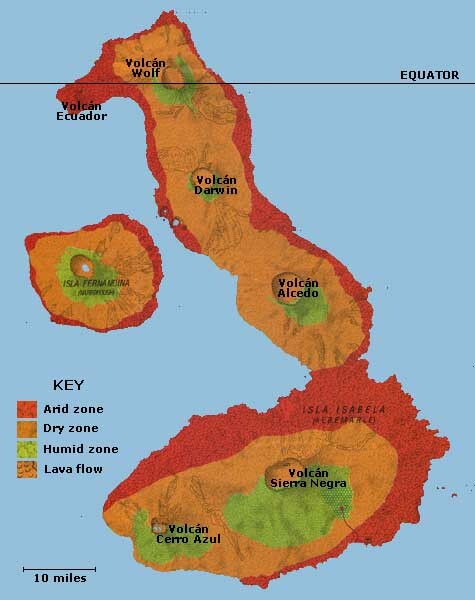 is the product of not one, but six integrated separate still-active volcanoes. has a magnificent and diverse landscape with many individually interesting tour sites and attractions. 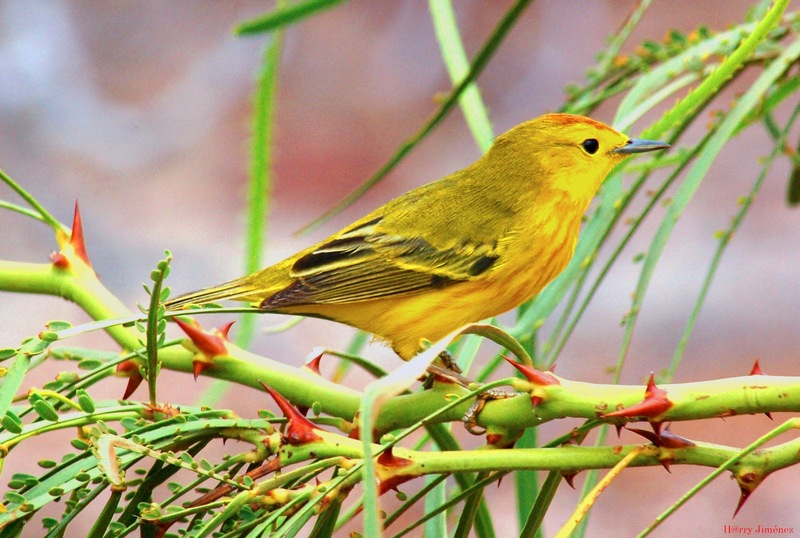 If your cruise takes you to the western side of Ecuador's Galapagos Islands, your ship will take you to marvelous inlets, coves, beaches and pools all around Isabela Island. 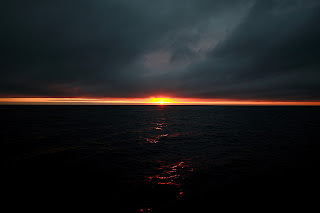 This post will bring you yet another new point of view and opportunity for learning and experiencing, not from the land, as my last post, but from the beautiful, stunning and ever changing Pacific Ocean. Each visitor to Isabela will experience this enchanted ground from a different perspective and Isabela has something to offer everyone. In Part I of our tour of the vast resources of Isla Isabela we visited the town of Puerto Villamil and the many intriguing visitor sites accessible from this small hamlet of just 2200 souls. Here, we focus on the astoundingly beautiful and diverse inlets, coves, beaches, snorkel and mangrove sites surrounding the island and visited by boat or panga. In Part III of our Isabela dream vacation, we will hike through the rugged, rough and moon-like terrain to its miraculous volcanoes. This article will guide you through the most significant visitor sites accessible only by boat, usually by cruise ship. 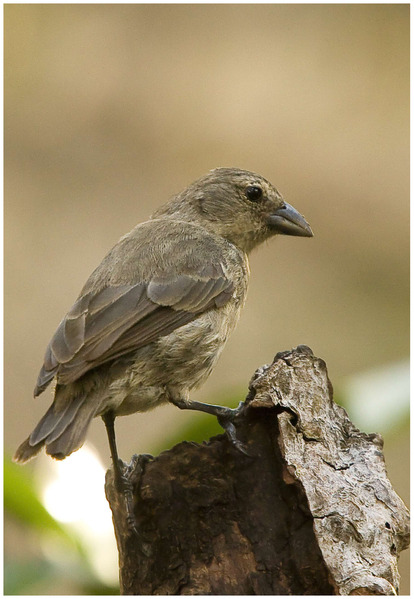 With rare exception, these sites are part of the Galapagos National Park system and heavily monitored and regulated for preservation and conservation purposes; human traffic is restricted. 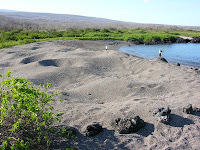 Black Turtle Point is located in the far west of Isabela Island. 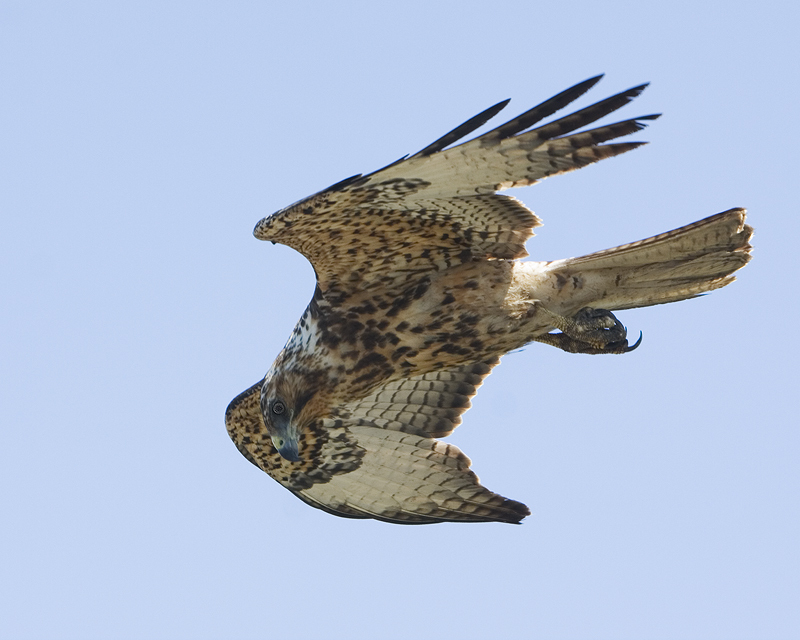 It is an exceptionally interesting site in terms of its formation. A significant seismic uplift occurred here in 1975. Until that time, the shoreline was lined with Red and White Mangrove trees. When the terrain lifted and expanded outward, the trees, which flourish only when their roots are embedded in the ocean's salt water, were left landlocked. With no place for their roots, most of the trees died. This is a very different site now than it was just a few decades ago. 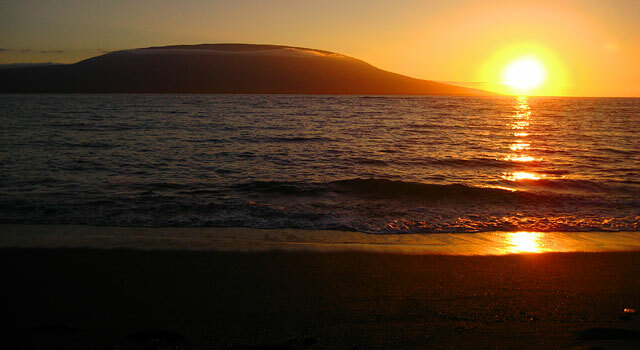 The beach gets its name from the color of its "sand". 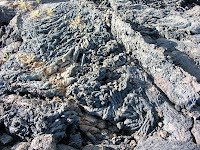 The "sand" - really finely crushed lava - here is black as the result of sedimentation and erosion of volcanic material. Imagine this beautiful vista that awaits you: coal black sand, a sparkling crystal sea with small white caps, and a gorgeous azure blue sky with puffs of white clouds. This is Black Turtle Beach. 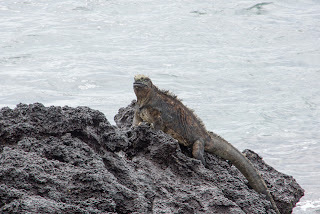 And, if that stunning visual image alone were not enough, this locale is significant also as a turtle nesting area and for its proliferation of sea lions and marine iguanas. Of course, this area is heavily protected. 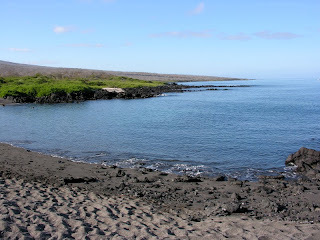 Black Turtle Beach is highly representative of the geological history and diversity of the Galapagos Islands in general and Isabela Island in particular. Trips to Elizabeth Bay are restricted by the National Park Service. 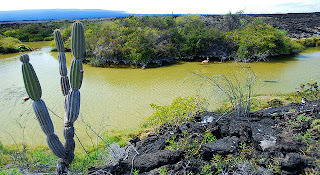 This inlet on the far western coast of Isabela at the Perry Isthmus is accessible by panga and no landings are allowed. The Bay is located where Volcans Sierra Negra and Alcedo join. This gorgeous marine bay is a wonder to behold. The reason is clear once you are there: this is the situs of the largest concentration of Galapagos Penguins anywhere in the world, along with a significant population of Blue Footed Boobies. 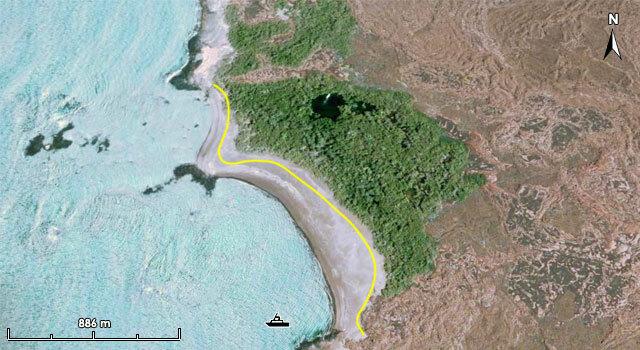 The beauty of this site continues as your panga takes you to an area surrounded by red mangroves. Hopefully, your guide will have the panga engines turned off so that you can listen to the calm that surrounds you. 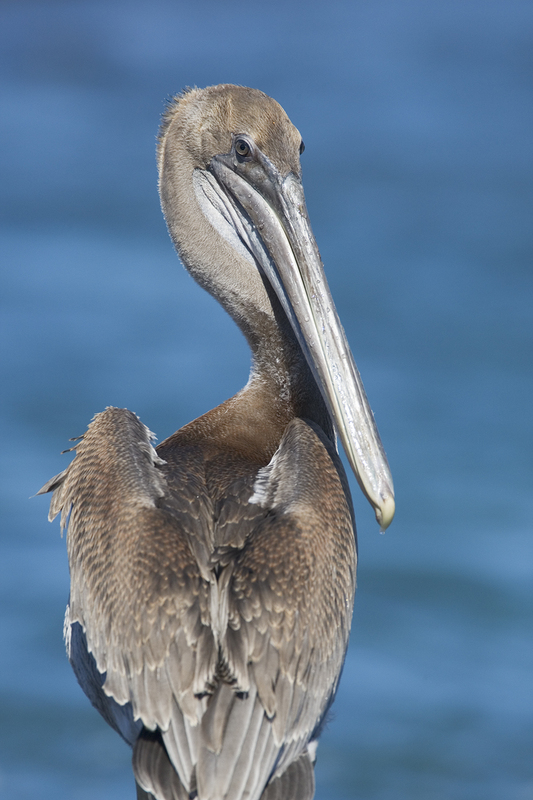 The silence is broken only by the calls of frigate birds, splashes of sea lions and swoosh of brown pelicans as they dive for food. 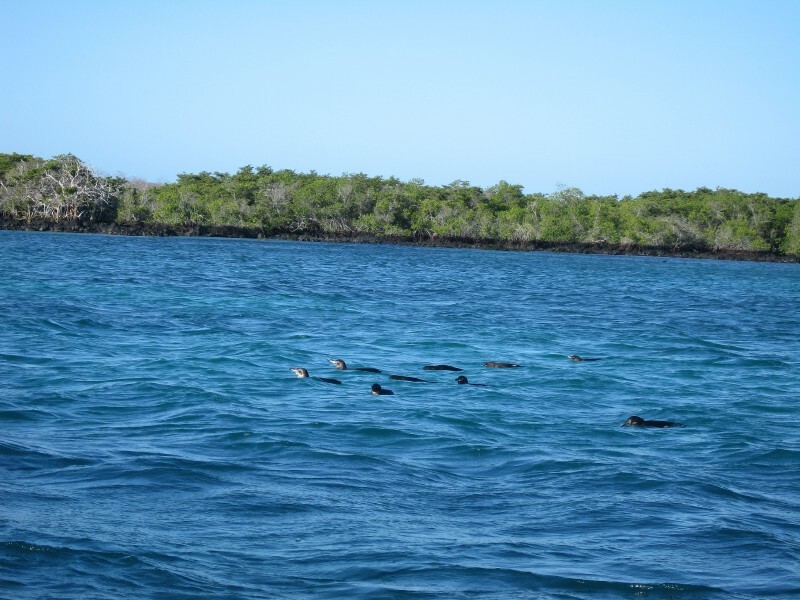 From the panga you should be able to look into the water below and experience sea turtles, spotted eagle rays, golden rays and even flightless cormorants. 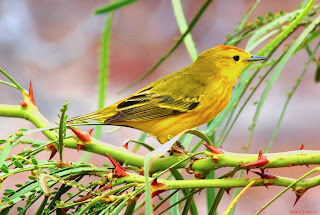 Cindy Procter-King wrote some delightful blog posts about her experiences at Elizabeth Bay and you can read more here. Moreno Point offers the opportunity for a hike and views that you will see no where else in the Islands. 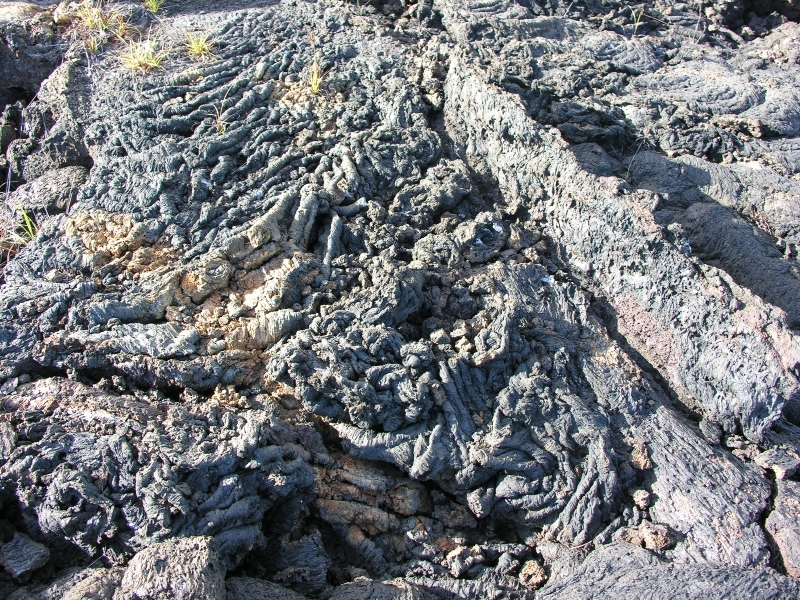 The pahohoe lava formations are highly challenging for hiking. 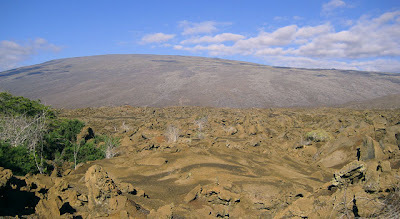 While some visitors see modern art, surrealistic elements, shadows of ancient relics, and other representation forms, the lava evokes for me images of millions of years ago when Isabela Island was formed by massive volcanic eruptions and lava flows. Here, you walk across about 700 meters of difficult broken lava formations; the area is open, a breeze is unusual and it can get very hot. 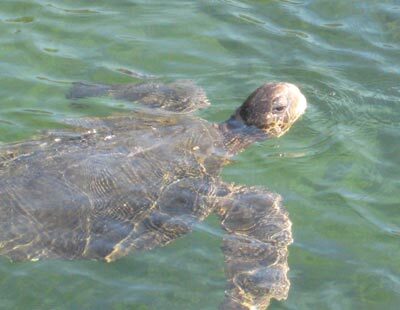 Though the hike may be a challenge, it is all the more rewarding once you see your first green sea turtle, flamingo or white-tipped shark along the way. 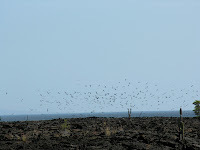 Punta Moreno is located on the north coast of Isabela Island between the Sierra Negra volcano and Cerro Azul volcano. 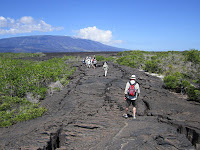 The distance of the trail is about 2100 meters, and it runs along a pahohoe lava flow into a complex of coastal lagoons. 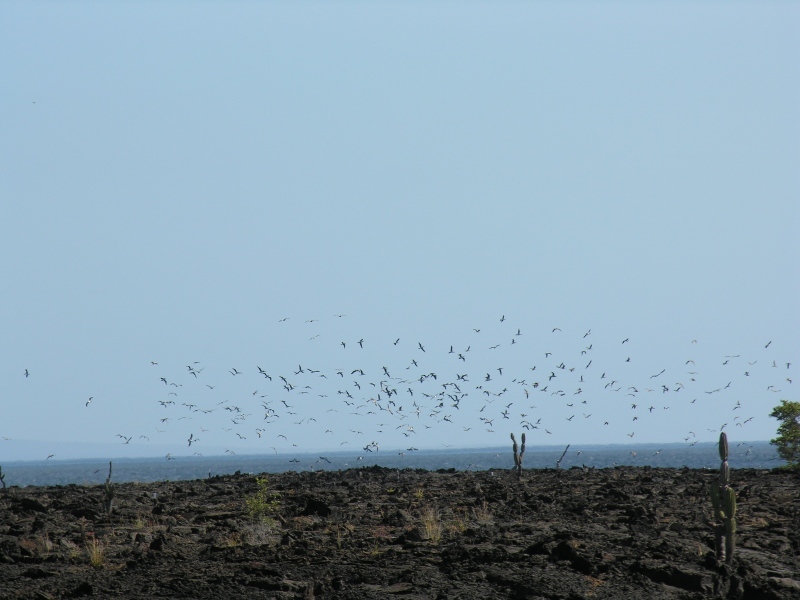 Vegetation is sparse at Punta Moreno; the density and depth of the lava sees to that. 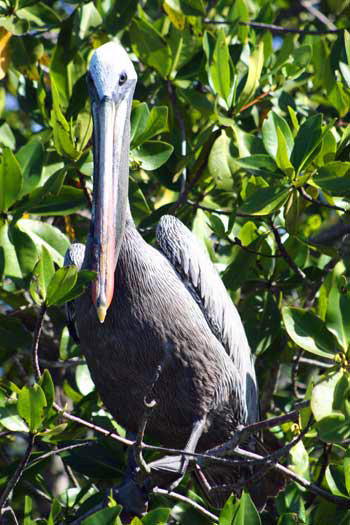 However, there are isolated areas of mangrove trees around the lakes. 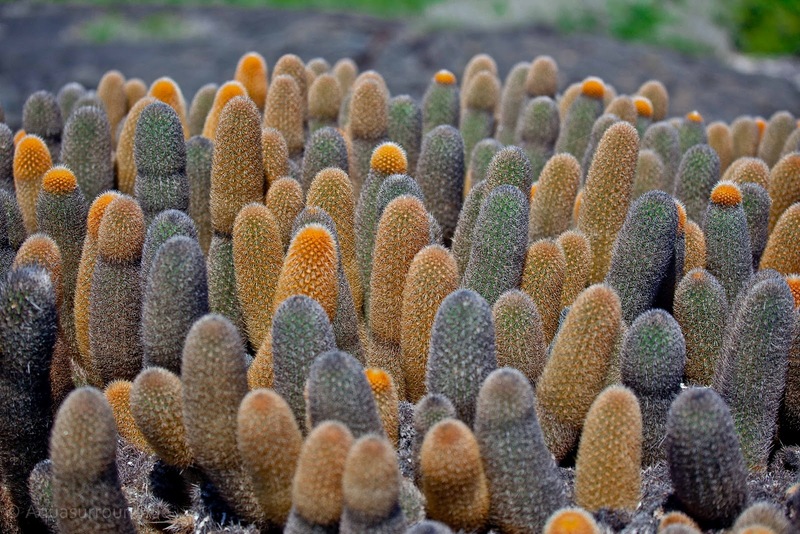 There are also three species of cacti found here. The main attractions at Punta Moreno are coastal lagoons and black lava flows that are home to many bird species. It has a panoramic view of three active volcanoes: Sierra Negra and Cerro Azul on Isabela as well as La Cumbre on Fernandina Island. An excellent source for experiencing Punta Moreno for the first time is Cindy Procter-King's blog. Her photos (below) tell a little of the story. Punta Albemarle, the northernmost visitor’s spot on Isla Isabela, has two separate attractions. 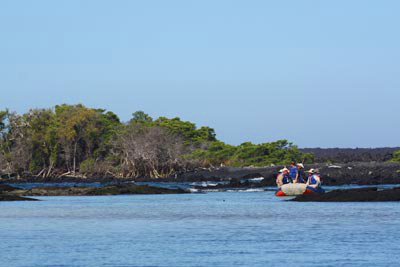 The first is a mangrove area located between several different Pahohoe lava floes. If you have the opportunity to travel here, it will be by panga. Separately, you may see the former radar base used by the United States during World War II. 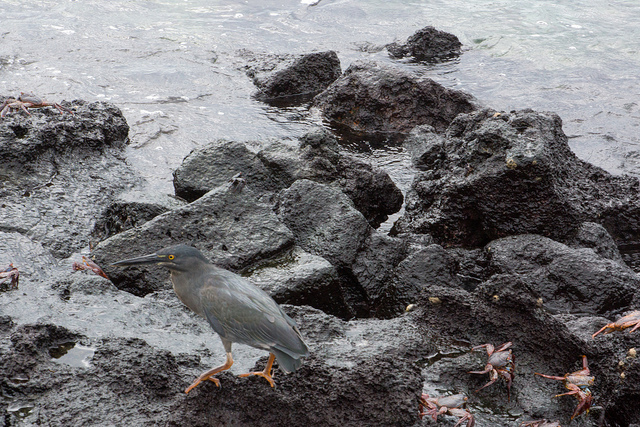 Below are additional examples of some of the bird and marine life represented at Punta Albemarle. These photographs are all by Philip Marsh, courtesy of Creative Commons. At Albemarle there are many large marine iguanas – the largest in the entire Galapagos system. 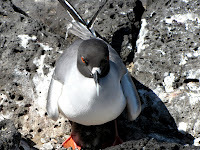 Other species at Punta Albemarle include flightless cormorants, multiple types of sea birds and ever-present sea lions. 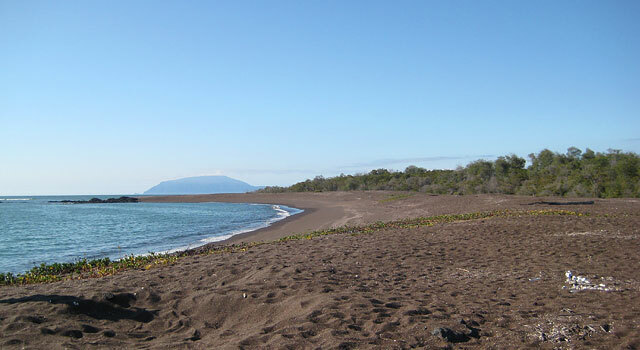 Urbina Bay is located between Tagus Cove and Elizabeth Bay on Isabela’s west coast at the foot of Alcedo Volcano. This is a beautiful location to walk on a white sandy beach that abuts dark volcanic lava formations – the contrast in color and texture is striking. A major seismic uplift happened at Urbina Bay in 1954. The land rose over 16 feet, causing a ½ - ¾ mile wide expansion of the shoreline. In other words, the reef that was underwater and off of the shore became the shoreline. In a moment of time, marine life that was swimming on and above that reef became stranded out of water on a new shore. According to reports at the time, the uplift was noticed by passing fishermen who smelled the stranded marine life. Apparently the land shifted so quickly that the fish and other sea creatures had no time to swim to safety. 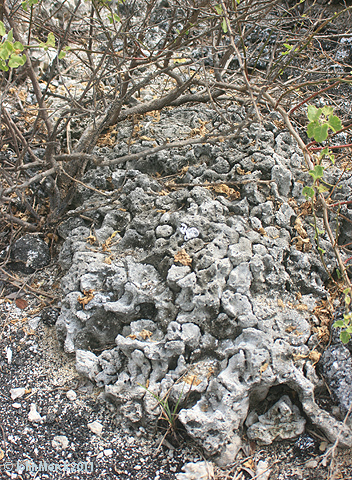 Coral was very much affected by this activity as well and, today, boulder-sized pieces of coral may still be seen on the area of the uplift. It’s worth noting here that many tourists are tempted to touch the coral – it is strange and beautiful. But, it breaks and disintegrates at the slightest interference so touching is forbidden. Just weeks after the uplift occurred, Volcan Alcedo erupted. 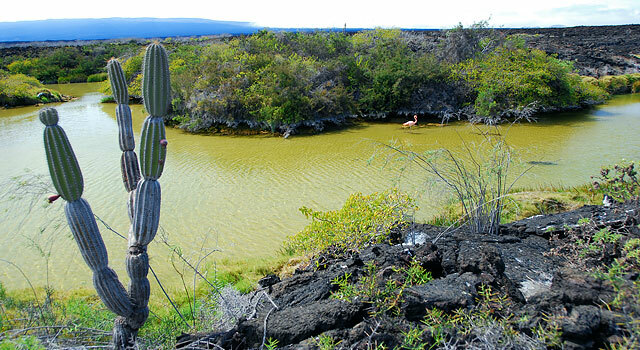 The trail at Urbina Bay is approximately 3200 meters, often a hot trek where you will need plenty of water. 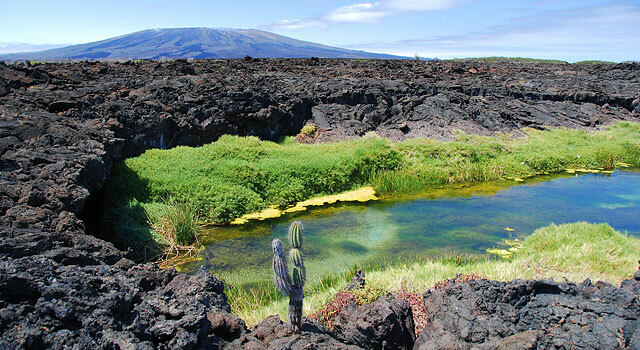 Once you achieve your wet landing on the beachfront (notably the wave activity here can be heavy), and have an opportunity to see the strange and wonderful results of the uplift, your hike will take you through the panoply of volcanic formations. 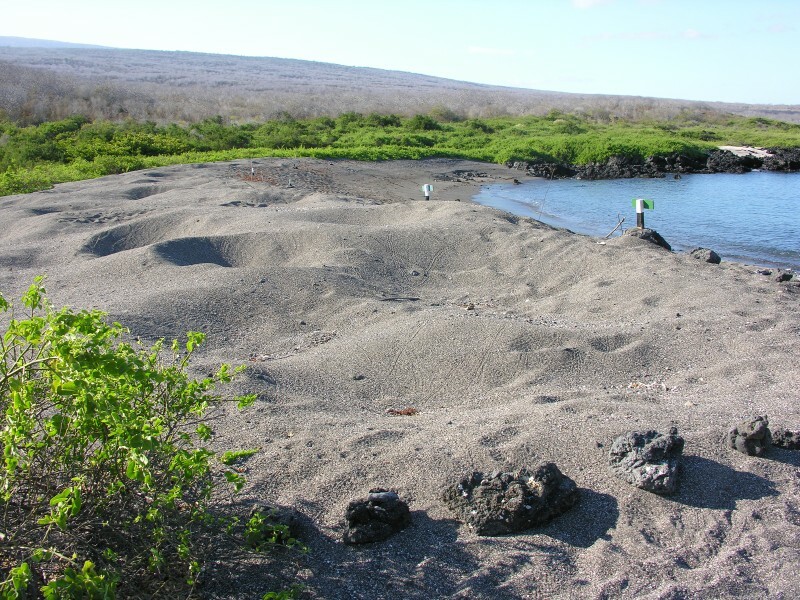 You will be able to observe sand substrates, pumice rock, lava, coral and vegetative formations. One of the most exciting things awaiting you are the huge land iguanas and their deep sand burrows; don’t step on these guys – even though they may make it difficult for you as they lay quietly directly in your path. 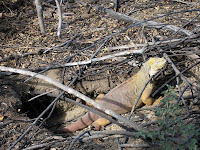 Read more about the Galapagos Island Iguana in my earlier post. 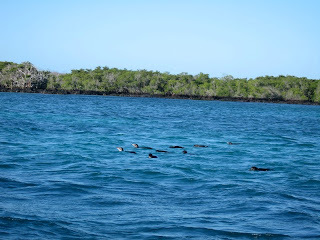 Other Galapagos iconic species that use this area for nesting are Galapagos Tortoises, flightless cormorants, brown pelicans and Galapagos Penguins. 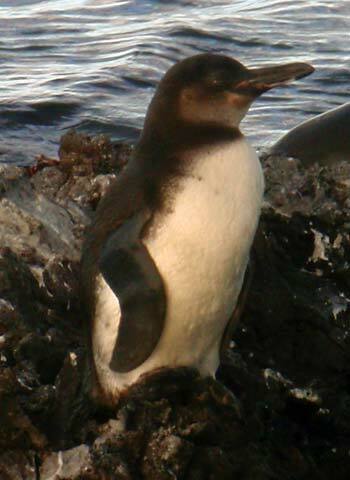 Since 95% of the Galapagos Penguins live on the two most western islands – Isabela and Fernandina – sitings are more likely here than in many other locations throughout the archipelago. In the summer, particularly, you might see the giant tortoises as they migrate from the highlands to lowlands for breeding purposes. 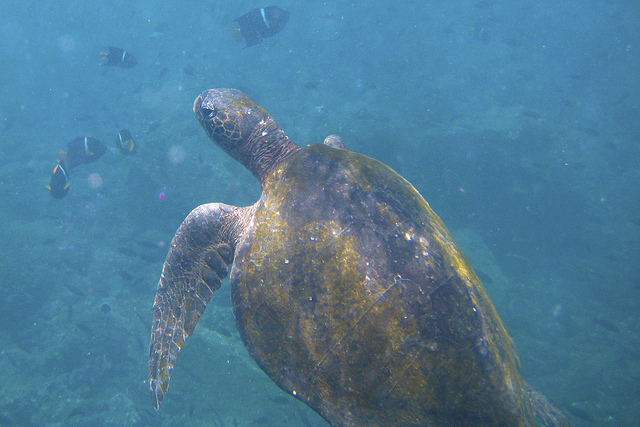 This area is also a great place for snorkeling. 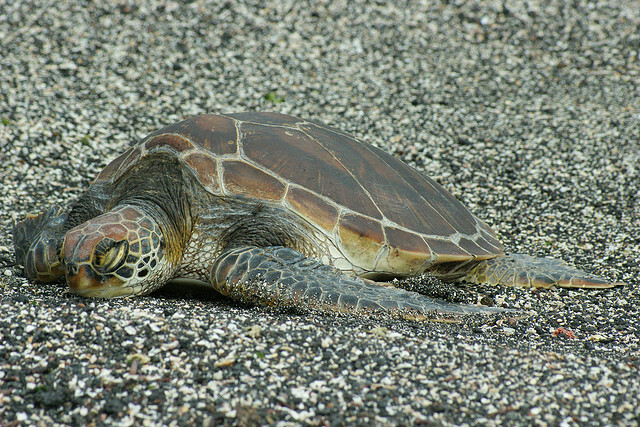 Green sea turtles, rays and even spiny lobsters frequent these waters. 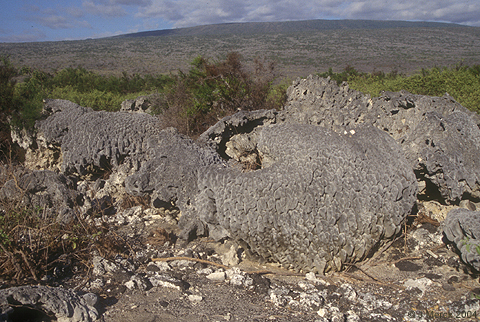 This photograph depicts the dramatic, almost surrealistic, view as you near Roca Rodando: a barren monolithic structure emerging from the sea about 30 kilometers from the northwest tip of Isla Isabela. 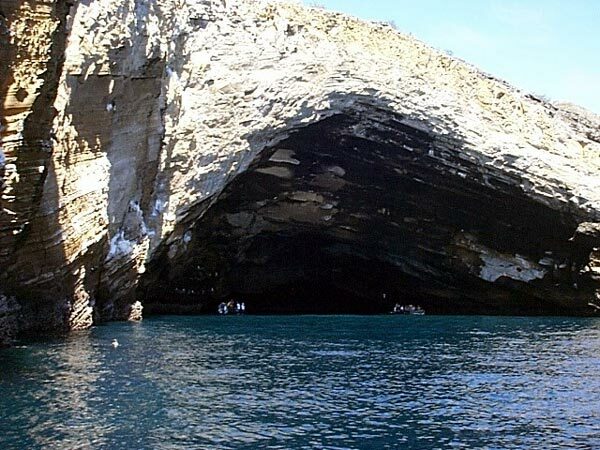 Because it is out of the way, not many travelers have the opportunity to visit Roca Redonda (Round or Rolling Rock), but those who do experience some of nature's true glory. And with that, generally comes a bit of introspection and calm. Roca Rodando can be said to be in the middle of no where and its gravity and presence are surprising. This solitary monumental rock, with extremely steep cliffs and a flat top, rises nearly 1000 feet above the sea. 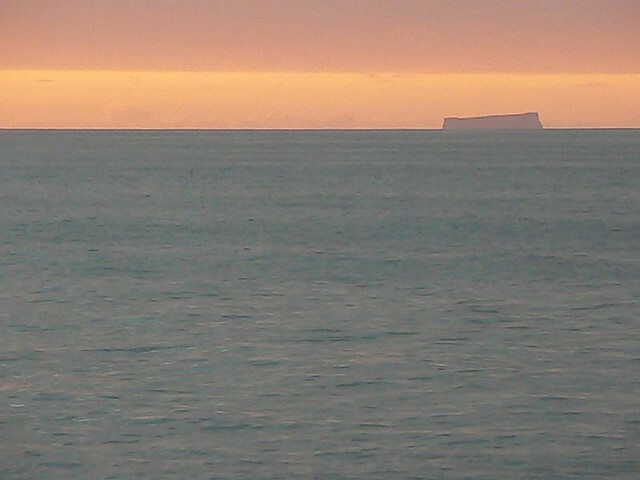 The top of a shield volcano, Roca Redonda has a huge underwater circumference of 18 kilometers (46 miles). Though viewed only from a boat, and inaccessible except for divers and some strong snorkelers, it still is a stunningly visual and memorable sight. You may be lucky enough to see Roca Redonda as you travel around the top of Isabela Island or on your way to Wolf or Darwin Island. Those who do dive here will experience colder water than in many other locations, due to the Cromwell Current. 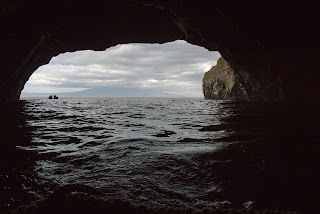 Several lava flows can be observed on the island and in the shallow water and there are various caves. 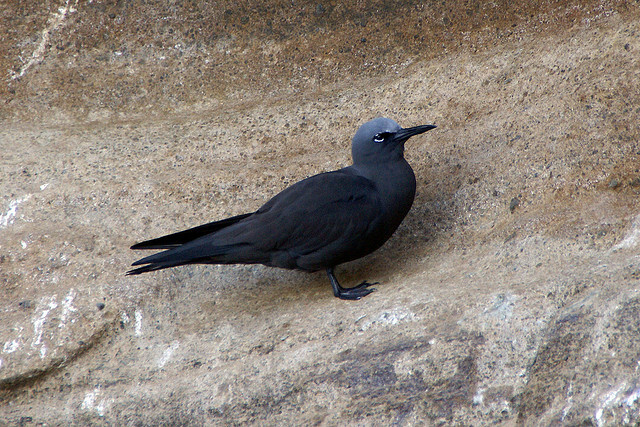 Seabirds live here, for example the swallow tailed gulls (Larus furcatus). 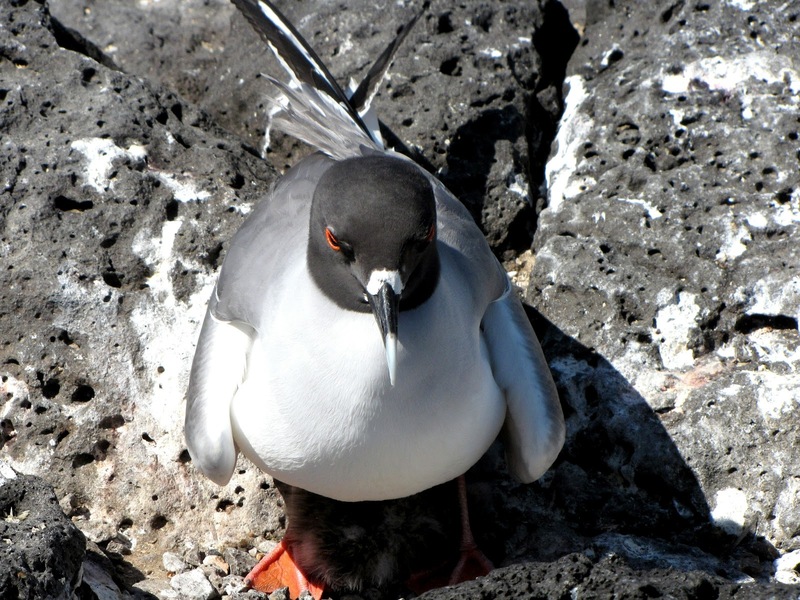 These gulls are endemic to the Galapagos and the world's only night-feeding gull. It has unusual large eyes surrounded by red circles and feeds on squid that come to the surface, usually about 15-30km distance from the nearest land. The water temperatures are very low here, because of the cold Cromwell current. Diving can be difficult because of the strong currents, unpredictable downcurrents, eddies and the heavy surge. 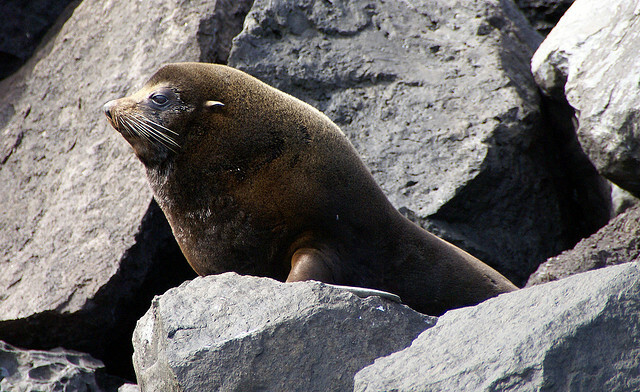 Divers are apt to see sea lions, schools of scalloped hammerheads, yellow tailed surgeonfishes, barracudas, jacks, Galapagos grunts, king angelfishes, Galapagos and white tipped sharks, mantas, and even sunfish. With luck you can also find sea horses. 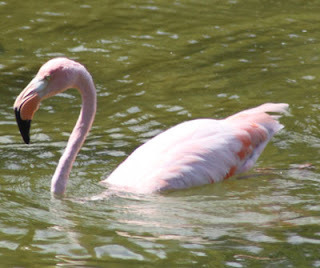 A special attraction is on the Southeast Side of the island. There are several underwater steam vents and gas bubbles rising to the surface, evidence that the volcano is still active. Tagus Cove is located west of Darwin Volcano. You will have a dry landing to a stairway built into the rock and continuing onto an 1800 meter trail running along a rugged lava terrain. A highly unusual sight here is the graffiti scratched into the rocks; most of these inscriptions are more than 100 years old and link back to a time when this area was populated by pirates and whalers. Even today, whalers scratch the names of their boats on the rock face. The trail at Tagus Cove leads to Darwin Lake and Darwin Volcano, both of which are discussed in Part III of the Isabela Visitor Sites posting. Tagus Cove itself is quite beautiful and perfect for a delightful panga ride. 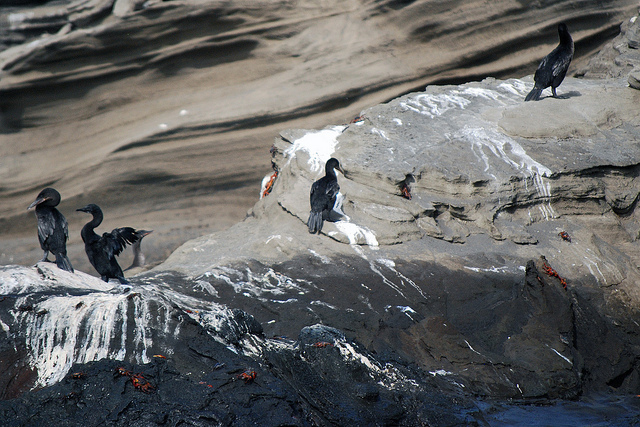 The water here is colder than most in the Galapagos Marine Reserve because of the Cromwell Current and this makes it a perfect locale for siting Galapagos penguins. 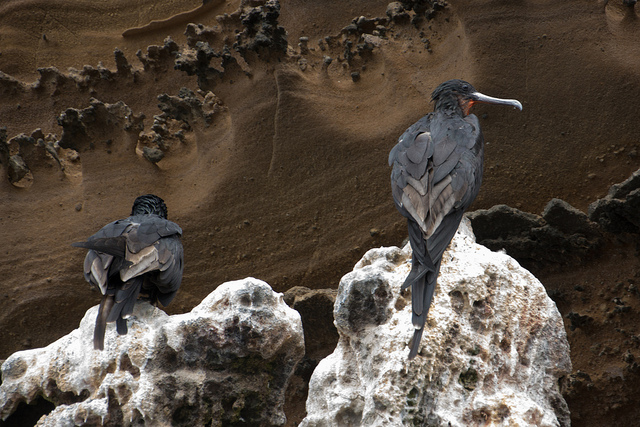 Also frequently seen here are Flightless Cormorants, one of the most interesting of the Islands' endemic species. Another frequently seen bird is the comical and delightful Blue Footed Boobie. 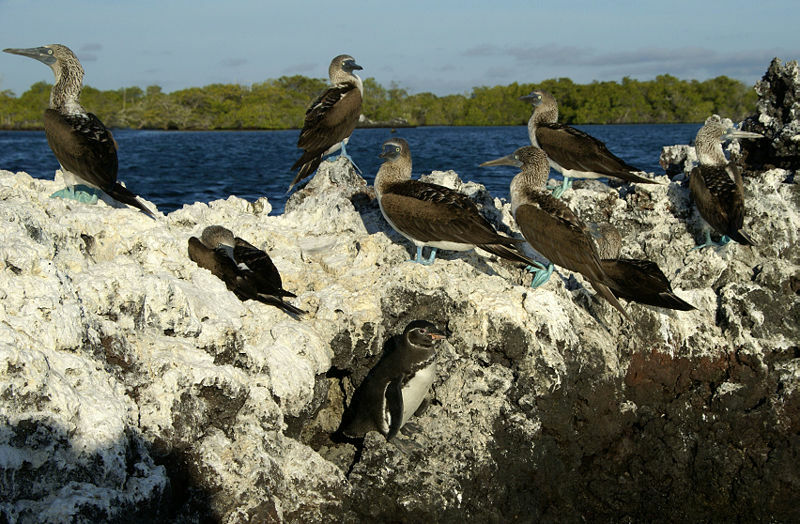 No matter what, your visit to Tagus Cove and its surroundings will be memorable, but maybe you will be lucky enough to see Blue Footed Boobies diving into the water as in the following video, by Galaticatt, which I found on Youtube. Another dramatic and stirring video of the area can be seen by clicking here. For a 360 degree panoramic view of Vicente Roca Point also by Pablo Castillo, click here. 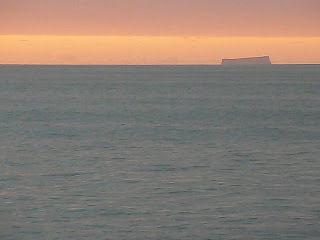 Vicente Roca Point, located on the north-western coast of the island, is comprised of two separate coves and is not a landing site. This large bay is a spectacular location for viewing a variety of marine and avian life, some that you are unlikely to encounter anywhere else on your journey. 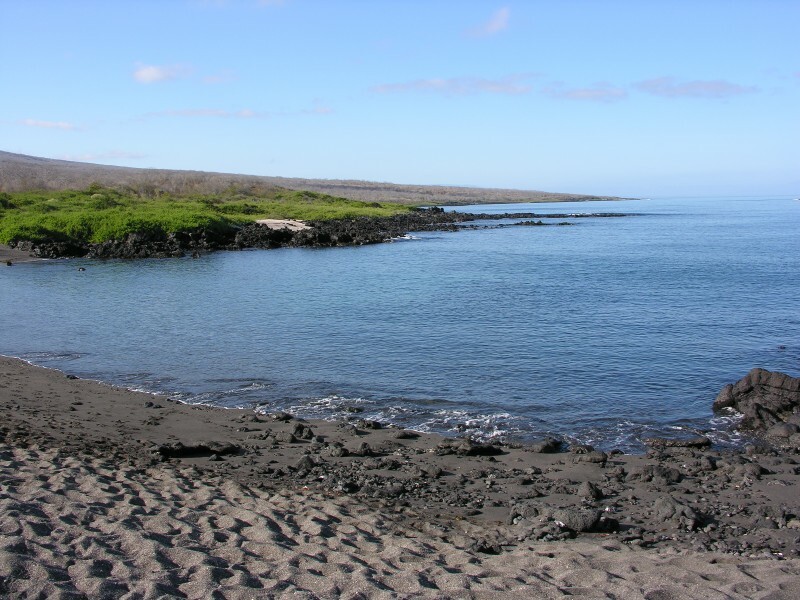 This bay is great for diving and snorkeling. Seahorses, sea turtles, and the strange yet fascinating Mola-mola (sunfish) may be spotted here. 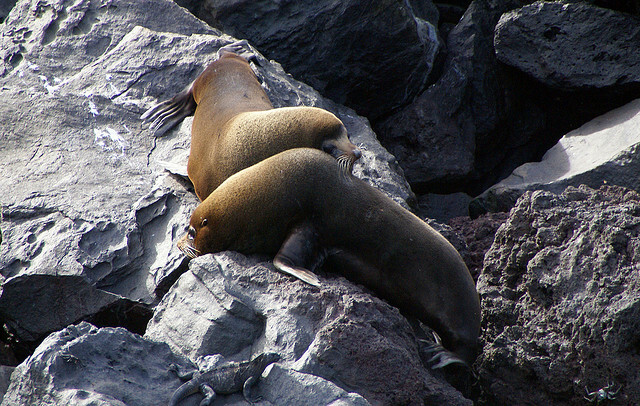 Even fur seals bask on the sundrenched rocks at Vicente Roca Point. 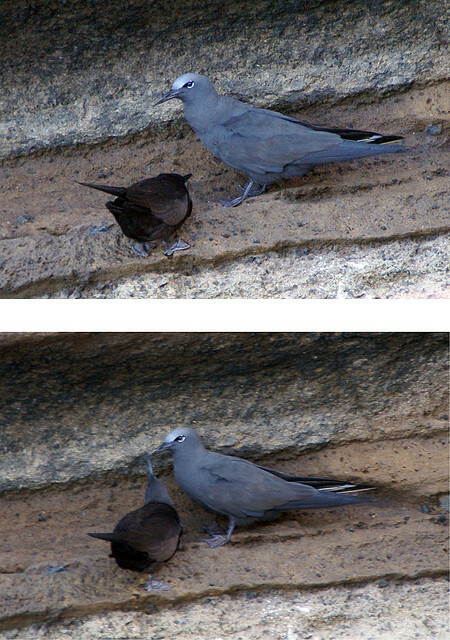 Nazca and blue-footed boobies sitting on the steep rocks, while cormorants inhabit the shoreline. I hope to return to Paradise some day. �� best summer! to read through articles from other authors and use something from their sites.